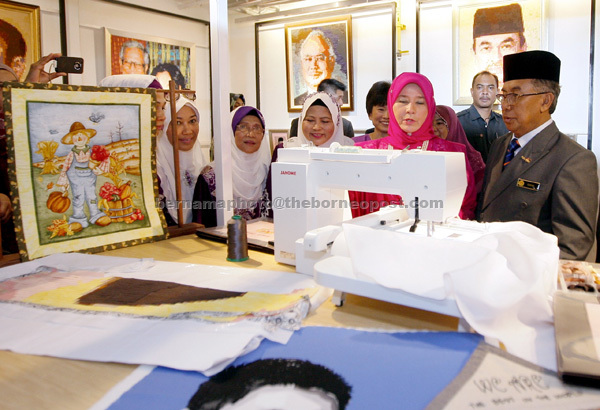 KUALA LUMPUR: The exhibition center and creative arts training seam known as the ‘Sewing World’ was launched yesterday with the aim of strengthening and expanding the market for creative sewing art thus developing the local economy in this country. The center is operated Creative Sewing Association (SJK) in collaboration with several agencies including Epal Handicraft Training Centre (EPAL), Cooperative Trade Seni Malaysia Sdn Bhd and Yayasan Mostwell Innovative Mostwell (WWW). SJK patron, Tengku Puan Pahang Tunku Azizah Aminah Maimunah Alexandria Se-wing said the launch of the World is also expected to make a positive impact in areas such as education, tourism and handicrafts. “It is expected to positively impact the economic development of the society in various fields that can help people empower their lives,” he said when opening the Sewing World here. Meanwhile, SJK, Fully Chye Goet Lee said the association aims to train 20,000 tailors creative within five years. SJK he now has trained 5,000 members through 15 training centers across the country EPAL. “With the establishment of the Pan-wing World, it will be the platform that produced the product market and provide training for those who are new to cultivate the creative world of sewing,” she said. Among the creative products displayed and sold including handicrafts, bags and patchwork art products. Fully hoped that the center could attract le-bih disabled people to make creative sewing art as a contributor to their earnings. “Some pilot who trained at PJSK has become a lucrative income entrepreneurs through a program of socio-economic improvement through the program ‘handmade market’ SJK.